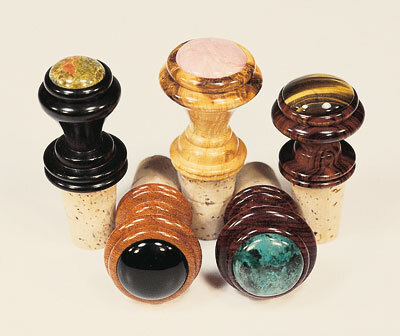 Wine-bottle stoppers make good use of exotic woodturning blanks and offcuts. They can be made fairly quickly and allow unlimited design possibilities. Those sold at craft fairs are usually fairly plain, but I make more opulent ones by using exotic woods and inlaying them with precious or semi-precious stones. for standard versions. Precise measurements and drilling is needed to ensure the inlay fits accurately and to allow for subsequent wood movement. And it takes extra time to match each stone's colour and grain characteristics to the best stopper blank. Select and cut blanks 38 x 38mm (1 1/2 x 1 1/2in) for 25mm (1in) diameter inlays, or 32mm (1 1/4in) for 20mm (3/4in). I like to use highly-figured exotic timbers and burrs for the stopper bodies. The figure must be very tight, so it will show up well in the finished piece. 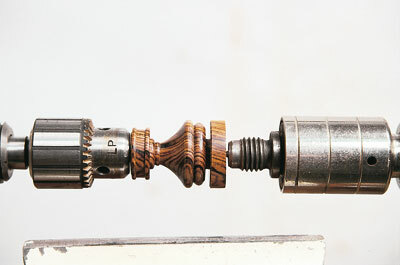 Drill each blank to a depth of 32mm (1 1/4in), using a 10mm (3/8in) bit. Place several drops of glue (thick set CA, or a Polyurethane glue) into the drilled hole. (If the timber is an oily exotic, swab the hole with acetone and allow it to dry before gluing the dowel in place). Insert a fluted maple dowel into the hole and make sure it seats firmly. This leaves about 38mm (1 1/2in) of dowel exposed for mounting in the chuck. Yellow glue or poly glue can be used to secure the dowel, but need a much longer drying time. 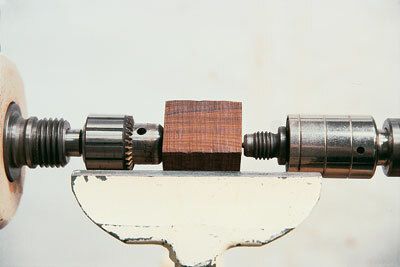 I use a production dowel chuck, designed for holding 10mm (3/8in) dowels, to turn the stopper body. The centre section of the jaws has been drilled out to accept a 10mm dowel, so it grips 100% of the surface of the dowel when compressed. Standard drill chucks only contact the dowel in a narrow strip in three places, increasing the chance of it breaking during turning. A pin chuck or screw chuck can also be used to turn the stopper body, making use of the drilled hole, as well as numerous other chucking methods. Insert the fluted maple dowel into the dowel chuck and gently tighten all three jaws. Bring up the tailstock with a revolving cup centre attached. This stops the dowel breaking during the initial rounding-over phase. I use a lathe speed of 3,000 rpm for all phases of the turning, including sanding and finishing. The faster speed allows a more elegant cut and reduces the overall time required to complete each piece. I use miniature turning tools to shape the stopper body. 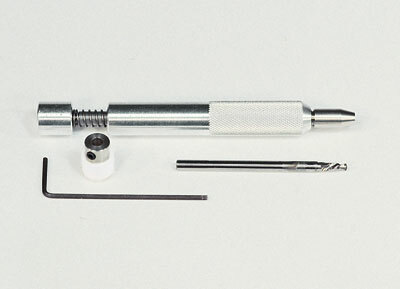 They include 6mm, 3mm and 2mm (1/4in, 1/8in and 5/64in) spindle gouges and a 6mm (1/4in) skew chisel. 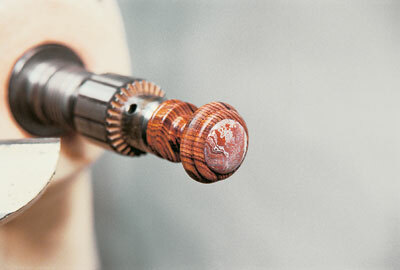 Using the 6mm spindle gouge, round over the stopper blank to form a smooth cylinder. Square up the bottom section of the stopper body using a 1.5mm (1/16in) super-thin parting tool. 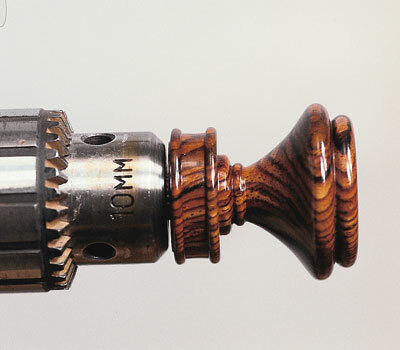 Stop the lathe and examine the stopper blank for defects and grain patterns. If the piece has checks or large defects that cannot be turned away, discard it. Now you need to decide on the size and type of inlay. Polished stone/agate cabochons come in many different sizes, from 2 to 38mm (5/64-1 1/2in). Choose those with colours and grain patterns that complement the highly-figured timber in the blank. After you have chosen the inlay's size and colour, set it aside for later use. 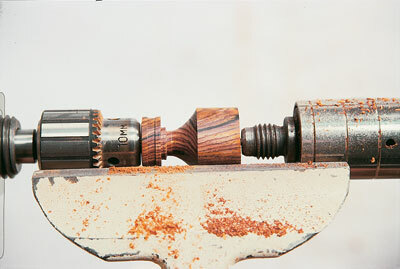 The mid-section of the stopper is turned next with the 6mm (1/4in) spindle gouge. Use the 1.5mm parting tool to make a shallow relief cut above the completed lower section, into the body of the stopper. The middle section should flow gracefully from the bottom of the stopper into the upper inlay area. Choose body designs that are easy to grip and have no sharp edges. Beads and other details are done with the 6mm skew and the 3mm or 2mm spindle gouge. The inlay recess area at the top of the stopper is turned next. Remove the tailstock to get to the top of the stopper. Graduated beads on the top are excellent designs for holding the round inlays. Measure the inlay and cut a flat-bottomed recess slightly smaller than the diameter of the inlay. Turn the 6mm skew chisel on its side and use as a tiny scraper to cut the recess. Once done, use the skew's pointed tip to make a dovetail rebate of 2 degrees on the inside wall of the recess. This 2 degree rebate allows expansion room for the inevitable movement of the dissimilar materials. Place the cabochon over the inlay area and ensure it fits the recess correctly. The very bottom of the stopper is the last area to be turned. Use the 6mm spindle gouge to turn a slight concave, so the top of the cork will fit tightly against the body of the stopper. your chisel work is good, you can start sanding at 320 or even 400 grit. If it isn't, drop down to 240 grit, or lower. Many exotics are sensitive to friction heat, so take care to prevent heat checking. 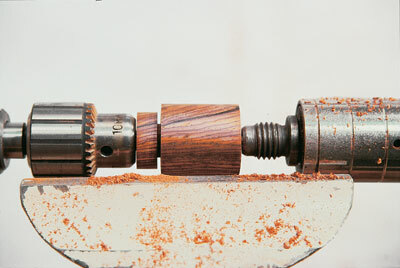 If you must begin sanding with coarse grits, give the stopper a quick shot of compressed air between each grit change. This will cool the surface. Finish sand the outside of the stopper body (taking care over the inlay recess) to at least 600 grit. The surface of the timber will be greatly improved if you reverse sand between each grit change. High-end stoppers in my workshop are sanded to 1500 grit. After sanding through the grits, take the last grit and sand by hand in the direction of the grain. A No. 0000 wire wool burnishing follows next, with the lathe set to 3,000 rpm. A compressed-air blast and a tack rag remove residual sanding dust. The last step in treating the bare surface is to use a special cutting or burnishing wax, to leave a smooth, mirror surface, ready for finishing. These contain ultra-fine abrasive compounds which remove fine sanding scratches and greatly increase the resulting brilliance of high gloss finishes. 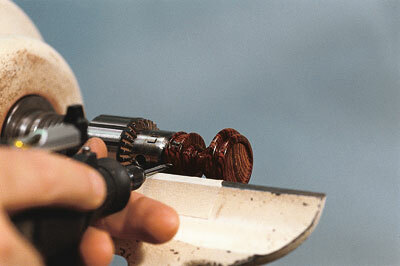 Before applying a finish, it is important to apply a primary sealer to the stopper. French polish and cellulose sanding sealers work very well and can be friction dried in a few seconds. Spirit sealers will also work, but require up to 15 minutes to dry. The intermediate finish is applied next. 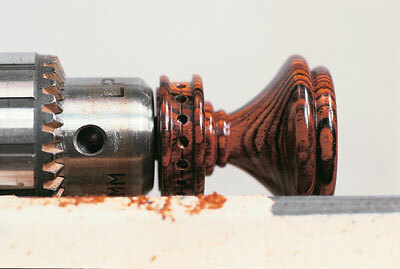 Several finishes are used, depending on the timber and style of the stopper. These include Myland's High-Build Friction Polish, French polish, Shellawax, Lacquer and a few home-made finishes. Certain finishes and timbers also get a final coat of pure carnauba wax to enhance the gloss. This is applied while the piece is spinning at 3,000 rpm and then polished out with kitchen papers to a brilliant gloss. These finishes are very durable and stand up well to bumping around in kitchen drawers. An adhesive strong, yet flexible when cured, is needed to install the polished stone or agate cabochon. Use a standard jewellers' epoxy to mount it. If you use another type, it must remain flexible when cured for best results. Unsuitable for this type of mounting are 2-Cyanoacrylic Ester Polymer adhesives (CA Glue). Polymerised CA glue is rather brittle and does not stick well to the highly-polished surface of some stones. Before putting in the inlay, use Acetone to carefully clean the stopper inlay recess and the bottom of the cabochon. This removes any oils from the surfaces and ensures a strong bond with the adhesive. Apply a small amount of E-6000 or epoxy to the cabochon and press it into the recess. The stone should 'pop' in, with gentle pressure. 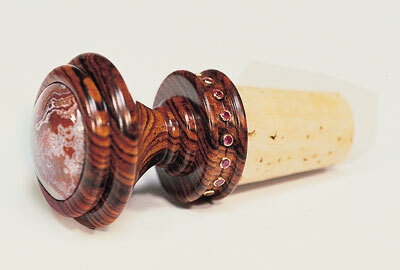 Align any cabochon grain with that in the stopper body. This important step will contribute greatly to the beauty of the stopper. Take a pre-drilled bottle cork and apply a small amount of thick CA glue to the fluted dowel. Yellow and poly glue can also be used to secure the two. 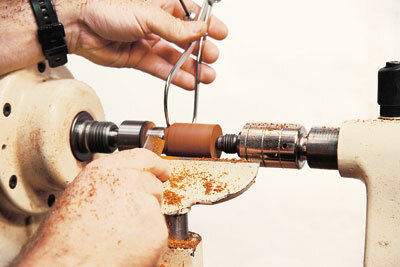 Push the cork onto the dowel in a spinning action, to evenly distribute the glue along the fluted shaft. 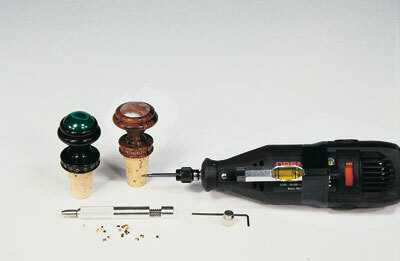 Make sure the top of the cork rests firmly against the bottom of the stopper body. Sand the bottom of the cork and any exposed dowel until it is flush and smooth. Blow off any sanding dust and seal the bottom of the dowel with creamed beeswax. Wipe off any excess and lightly polish the bottom of the dowel by hand. Wrap the exterior cork with plastic shrink-wrap, ensuring a tight fit. This will keep the cork clean and sanitary until it's sold. While this may seem like a lot of trouble for a bottle stopper, it becomes second nature after a while. Your reward can be a significantly higher selling price for your efforts. The inlaid stoppers from my studio start at $20 each and go up to $205, depending on the style and quality of the inlay. It was challenging to take gemstone settings made for the jewellery trade and modify them for inlaying into wood. An essential design aspect of a gemstone setting is to allow light to penetrate in and around it, for maximum brilliance. So choose your settings well and be prepared to modify stopper designs for inclusion of the inlay. Individual gems can be inlaid into various styles of single settings, but the style of the setting may have to be modified for best results. To simplify things, you can install pre-set stones. These come in split bezel settings. Swarovski markets a line of these pre-sets called Swarogem Pre-Settings. Various genuine stones are available including amethyst, citrine, peridot and rhodolite garnet, set in genuine 14K yellow gold split bezels. Genuine stones are only available in 2mm (5/64in) diameter bezel-sets. Synthetics are available in 2mm and 2.25mm bezel-set styles. I prefer the 2.25mm style when using synthetic stones. The pre-set is designed to be installed into a specifically shaped and tapered hole. This is done with a custom-made carbide stepped drill bit, available from Swarovski. A specialized setting tool is also needed. This picks up the tiny pre-sets and installs them into the drilled holes. I drill these with a variable-speed Dremel, set to 10,000 rpm. On very dense timbers, I will drill them at 15,000-20,000 rmp. Any similar high-speed tool can be used to drill the holes - even a standard drill press. But you must have a lathe with an indexing plate to accurately space your locations for drilling. As a production turner, I prefer to drill the holes while the stopper is still mounted on the lathe. My lathe has an indexing plate which enables me to drill them precisely. As all of my drilling for the pre-set holes is done freehand, I have taped a small line level to the top side of my Dremel. This helps ensure that penetration is square to the face of the stopper. Bring the toolrest as close as possible to the area to be drilled. I use a small strip of masking tape on the top of the toolrest, where I rest the drill bit shank during drilling. I add a small drop of oil along the taped area to reduce any friction. You will need a strong light illuminating the area, to monitor the depth of penetration and ensure uniform holes are being drilled. After all holes have been drilled, remove the dust from the drilling area and get rid of any any left in the holes. After drilling, you can begin inserting the pre-sets into the holes. The specialised setting tool makes it easy to insert the tiny pre-sets. To ensure the best appearance of the stones, plan your design on paper first. This is especially helpful when mixing different coloured stones. The pre-sets have tiny barbs on the lower part of the split bezel. Once inserted into the hole, they cannot be removed. Load the required pre-set into the setting tool and gently place the lower portion into the hole. Use a little pressure to insert it to the correct depth. Continue installing the pre-sets until all the stones are in. If necessary, gently buff the stopper body to enhance the finish. Don't buff over the inlaid stones, or you'll spoil the look of the pre-sets and reveal the base metal beneath those bezel settings that are not genuine 14K gold or silver. These inlay techniques work equally well on boxes, pens, desk accessories, bowls, platters and hollow forms. Also known as a live centre. It is used in the tailstock's quill, normally with a morse taper, to support the wood and revolves with the work. The picture shows a No 2 MT revolving centre being inserted into the quill of an SIP lathe's tailstock. "Precise measurements and drilling are needed to ensure the inlay fits accurately"
Most woodturning stockists carry a limited selection of round cabochons. For more, contact lapidary suppliers. There are two basic types of supplier - those who resell cut stones and those who manufacturer custom-cut stones to order. Try to hand pick the stones if possible. The quality and price can vary a lot from stockist to stockist. It's essential to ensure the cabochons are well calibrated (uniformly cut). Look too for a brilliantly-polished, uniformly-domed surface and a rounded edge. Some stones are ground to a knife-edge, making them a challenge to inlay into wood. Knife-edge stones are prone to chipping during handling and inlaying. Poorly-calibrated stones create gaps around the inlay recess, causing a poor-quality finish. A custom jeweller would make his or her setting fit the stones, but it's much more difficult for a turner to do this. So buy from suppliers you can visit or from places you have dealt with in the past and trust.